This stylishly grim adaptation of Graham Greene’s 1938 crime thriller updates the book’s 1930s setting to England’s mods-and-rockers early ’60s. The shift is less jarring than might be expected, and director/writer Rowan Joffe even manages to improve on certain aspects of the period-faithful 1947 film version (which was titled "Young Scarface" in the US). Where the earlier film softened the novel’s “Catholic noir” nastiness by toning down some of its brutality, Joffe has no problem showing a face splashed with acid, and a final-act demise that is more shocking than an unconvincing backward fall from a pier. Joffe also throws in a new seaside skull-bashing, and changes a shove through a broken banister to a murder that is both more sadistic and symbolic. 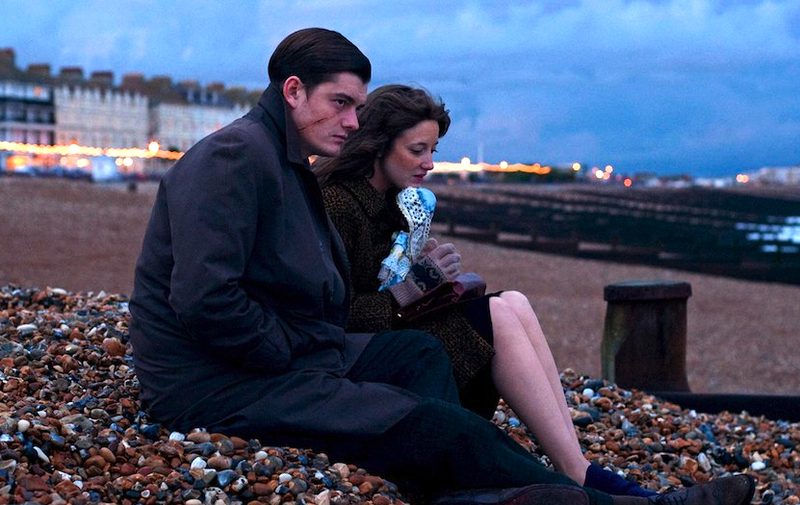 More significantly, Joffe’s "Brighton Rock" dispenses with nearly anything resembling comic relief. In 1947, Hermione Baddeley faithfully embodied the book’s self-righteous amateur detective Ida Arnold as a brassy busybody who believes in messages from the spirit world. In the new movie, Helen Mirren portrays Ida as a tough broad with more exasperated bitchiness than entertaining bluster, one who would roll her eyes at the idea of psychic phenomena. Both Idas are “prepared to cause any amount of unhappiness to anyone,” as Greene put it, to see justice done. The difference is that Greene’s Ida regards that quest as “exciting” and “fun,” while Joffe’s Ida is more disgusted and doggedly determined. Sam Riley is excellent as the ambitious, permanently angry and utterly amoral teenage gangster Pinkie Brown (played with more coolly casual contempt by Richard Attenborough in 1947). Pinkie is sure there’s a hell, but regards heaven as only a maybe. After the father-figure boss of his small-time outfit is killed by a rival gang member, Pinkie takes vicious retribution under a Brighton pier. He then strikes up a deceptive relationship with a naive waitress named Rose (Andrea Riseborough) to get his hands on a candid photo that could incriminate him. In Greene’s original, the man killed at the pier is a reporter, and Pinkie needs to retrieve a card used in an old-time newspaper contest. The alterations here work fine, and so does the transformation of Ida from a lusty woman of somewhat easy virtue to the sternly no-nonsense manager of the cafe where Rose works. Riseborough’s impressive performance in the difficult role of Rose is the biggest improvement over the earlier film. Carol Marsh’s 1947 Rose was too sweetly angelic to be believable as a shy teenager so dumb, beaten-down and desperate for affection that she would put up with Pinkie’s abuse and indifference. Riseborough’s Rose is more credible as an empty, willingly deceived romantic with a hint of corruptibility. When Pinkie pinches the skin on the back of Rose’s hand and Rose submissively tells him “you can keep doing that if you like it,” you believe Riseborough’s Rose really would let Pinkie keep hurting her forever — and that she would enjoy the attention. Joffe’s time-period change enables him to set an ambush knife attack in a big all-new ’60s scene. A massive squadron of scooters motors through the streets, followed by a full-scale 1964 Brighton Pier riot between well-dressed mods and scruffy rockers. (In the book and the first movie, the action in that scene was restricted to a far more limited scuffle at a race track.) Many of the new movie’s smaller moments also are memorable, such as Pinkie playing “she loves me, she loves me not” while pulling the legs off a spider, or purposely grinding black soot into a snowy white carpet. The remake stumbles at the finish by retaining a wrongheaded twist that first appeared in the 1947 movie. Greene, a cowriter of the 1947 screenplay, sacrificed his book’s chillingly devastating conclusion for a new ending that was unsatisfyingly saccharine but apparently more studio-acceptable. It is a moment of seemingly God-given grace that feels completely out of place in Joffe’s otherwise unsentimental retelling. That flaw isn’t enough to spoil the movie, which includes notable supporting performances by Phil Davis as Pinkie’s hopeless henchman Spicer, John Hurt as Ida’s intimidated cohort Phil Corkery, and Andy Serkis as the icily self-assured rival gang boss Mr Colleoni. Interestingly, it is Pinkie in the new movie who makes the comparison between the stick candy known as Brighton rock (“bite all the way down, it’ll still read Brighton”) and human nature. In the book and 1947 film, justice-obsessed Ida delivers the line. The fact that it works equally well coming from either character sums up the stark black-and-white theology of a story that’s just as beautifully bleak in color.